Home | FAQ | How do you fix the media? Fix by using vacuum or the screw holes for holding tools. According to the situation or condition of media, secure the media with tape. If, within the adsorption area, there are suction holes not closed by the media, close such suction holes placing thin sheet from material such as paper, film or tape. Print origin is right foreground. Use the threaded holes for fixing jig. Depending on the condition of your media, fix it with tape. If the vacuum table is used, it is possible to fix media with vacuum adsorption. 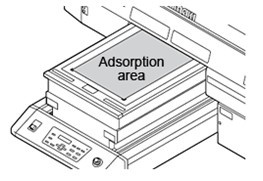 If some vacuum holes on the vacuum table remain open, the adsorption forth is degraded. Block them with paper, film, or tape as far as possible. The printing origin is at the front lower right. 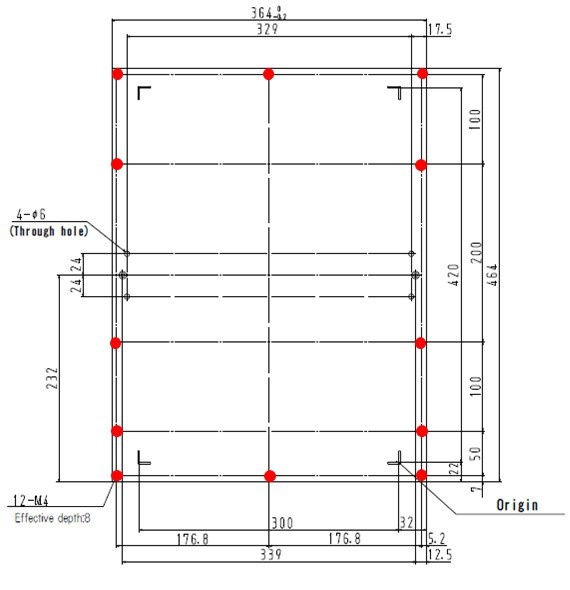 Position of the screw holes for holding tools. Which media size and weight can be used? What should i do when [ERROR60b WIPER BOTTLE] (or "WIPER BOTTLE") is displayed?